The small car segment has evolved quiet a lot in the recent years with the number of models expanding rapidly in number. Hyundai has always been a key player in the segment and its small cars are one of the best value-for-money options that one can get, be it the Santro or the Getz, i10 or the i20. The sub liter (1000cc) segment had no player from Hyundai until now, the EON is Hyundai’s newest and cheapest small car for India and it also happens to be one of the most anticipated car models of this year. We drove the brand new Hyundai EON on the city roads and highways of Udaipur to find out what really is ‘the EON’. 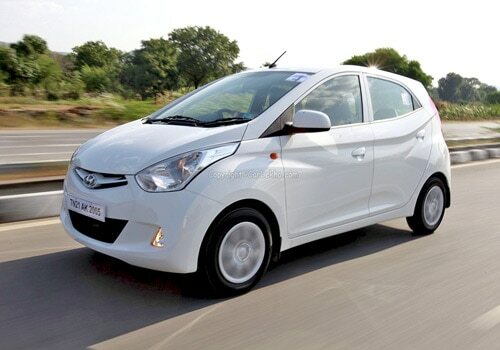 Read-On to find out all about this cute little car from Hyundai. It took Hyundai nearly 4 years and an expense of more than Rs 900 Crores in designing and developing the EON which was code named as the HA. The Eon has been designed at Hyundai's development centre at Namyang in Korea. But the Hyderabad R&D centre of Hyundai has also worked extensively on this project. We are told by Hyundai officials the `E` in the EON stands of Eternity. The design of the Hyundai EON can be described as a benchmark in the small car segment. It has got all the fresh looks and glitz on it just in the right place. The Hyundai EON has a very sporty fluidic shape to its exteriors. Hyundai has continued with the Fluidic design mantra and the EON happens to be the second car model after the New Verna to adorn the Fluidic matter. The front of the EON is where the fluidic design begins, a neat pair of clear headlights which are extended (elongated) till the ‘A pillar’, are shaped rather nicely flowing back with the body design. You have the Hexagonal grill upfront that has become a family face since the new Verna. A nice rich looking chrome strip runs across the top of the grill with the Hyundai `H` logo in the center in chrome. The air dam is an all black affair with the slats running horizontally across the front bumper. The EON gets a nicely done diamond shaped fog lamps that are neatly placed upfront. The front bumper gives a meaty masculine look to the EON’s front profile. Coming to the sides, the EON gets the fluidic sculpture flowing in abundance here, flared and rounded wheel arches add a lot of muscle to the sides along with the nice prominent body lines that flow upwards starting from the headlights and under the window area and finally mating with the tail lamps. Another soft body line flows on the lower side of the doors. Large body colored wing mirrors get a black tone on the lower part that looks neat. The mirrors are internally manually adjustable. The door handles also have the raised up leveling, the front door handle is on the lower height as compared to the rear door handle which is keeping in line with the flowing body lines on the sides of the EON. The side windows also the upward flow-design with the rear glass getting the shape with the body flow. The rear wheel arch also gets the muscular fluidic bulge as on the front which makes the sides look very muscular. The EON runs on 155/70 R13 tubeless tyre with full wheel caps on the Magna and the Sportz while the D-Lite and the Era get 145/80 R12 of tyre specs. Coming to the rear, the EON has a distinctive behind for a car in its segment; a fresh looking half moon shaped tail lamp that is neatly flushed in the body line looks strikingly different and lends a key sporty design input to the behind of the EON. The tail lamps look catchy and are large in size. The rear bumper is again meaty and keeping with the front bumper, it also looks muscular. The EON Sportz that we drove comes with an integrated roof spoiler with stop lamp as standard. The tail gate has a wide rear glass that aids rear visibility to the driver and a nice big Hyundai `H` emblem in chrome is placed on the tail gate. A micro roof antenna is placed on the top of the EON which again is of very good quality and finish. The exhaust muffler pipe is neatly hidden in the rear bumper and unseen. The Hyundai EON has been very well built; the paint quality and the metal panels are neatly done. The quality of the exteriors is of top most level of any Hyundai car, irrespective of the fact that it is the i10, i20 or the Verna. So, the EON is no exception it comes in six color options, White, Silver, Mushroom, Metallic Silver, Bright Blue and Red, we drove the White EON. Hop inside the Hyundai EON and you would be surprised with the sheer quality and fit finish for a car this price. The good thing here is that Hyundai has done no cost cutting on the EON unlike other car makers who do a lot of quality compromise on the interiors of a small budget entry level car model. The dash is a two tone affair with the top half in black and the lower half in beige color. A very rich look and feel texture has been given to the dash. Quality of the dash plastic is in the leagues of the i10 and the i20 which is very good. The instrument cluster is a three pod thing with the temperature on the left, fuel level on the right and the speedo in the center. The temperature and the fuel gauge are marked with green digital lights which again are a first in the segment. All the three pods have a silver lining around them enhancing their look and the speedo gets its needle in red with green illumination. The EONs instrument cluster gets two trip meters along with all the standard tell-tale warning lights. The Eons steering is a three spoke design with manual height adjusts on it which is a big boon for short and tall drivers. A neat silver insert with the Hyundai 1H1 logo in chrome makes the steering look striking for a car in this segment. The center dash gets a slight triangular recess inwards to accommodate a Gods Idol which is a special Indian touch on the EON especially for India. The AC vents look and feel good, under the vents is a double DIN MP3 – Radio unit that also has an integrated USB and AUX port upfront to connect I-Pods, pen drives and other portable music players. The EON comes with two front speakers as standard. Under the MP3 player is the AC/heater control unit with rotary knobs that have a very rich feel to them. The AC fan blower has a 4 speed setting to it. As with all Hyundai cars the EON too has a powerful AC unit that cools the cabin real quickly, the 4 speed blower is most happy on the first 2 speeds. A thick silver colored blushed metal like insert runs around the center dash and the music player which looks very neat. The EON has a extra large glove box and the point to be noted here is that the glove box has a nice tacky noise when you shut it, above the glove box on the dashboard you have a inwards recess that has been specially designed to keep a one liter bottle horizontally a touch again keeping in mind the needs of Indian customers. The EON Sports comes with a sporty upholstery seats that is a mix of faux Rexene and cloth. The front seats get integrated head rests. There is good amount of head room and leg room up front thanks mainly to the cab forward design of the EON. The driver gets a near to perfect visibility with a very comfortable driving position. The front seats are more than comfortable for a car in this segment. The gear stalk is at ergonomic distance and has an all black round knob. The steering and the gear knob have a very upmarket feel to them. The rear seat gets integrated head rests and is comfortable for two passengers. Support for the under thigh and back is decent enough and the seat in inclined to a very comfortable angle. Head room at the rear is good while the leg room with the front two seats pushed back is decent for a car this size. The seats are made of good quality upholstery with a nice amount of cushioning in them. The door pads get du-tone that is black-beige shades with the door opener in blushed metal silver that looks very rich. The EON comes with front power windows and rear rotary type windows. The EON gets many cubby holes and bottle holders in the door pads and in front of the gear lever which are very practical. The Hyundai EON also gets a driver side airbag which again is the first in its class. The EON has a large boot area of 215 liters of capacity; you want to know how large that really is? Compare the 215liter of the EON to the 165liters of boot space of the Maruti Alto and you will get your answer. The luggage area can be further increased by folding down the rear bench seats if needed. The EON has very nice and rich, well appointed interiors on a very spacious cabin for a car this size and price. The plastics used in here are of high quality and finish. So on the whole nowhere did we find any cost cutting or compromise made by Hyundai, hats off to Hyundai for keeping the interior quality of the EON at par with the i10, i20 and the Verna. Everything in here works well and looks and feels well built. The Hyundai EON is powered by an 814cc SOHC 3 cylinder Petrol engine that has 9 valves on it. This little engine generates 56PS of power @ 5500RPM and 76 NM of torque @ 4000RPM. We are told that this is the same i10 engine with one cylinder chopped off in the interest of fuel efficiency. This 800cc engine is mated to a 5 speed manual gearbox. Start the EON and you notice the 3 cylinder engine coming to life, there is not much vibration except for some that is felt on the gear shifter at idle. The engine is refined for a 3 cylinder engine and smooth. Shift to first gear and the EON moves ahead in a smooth linear fashion. The power delivery is good for a 3 pot car with the engine clearly tuned for high fuel efficiency and city bumper to bumper driving conditions. You get the gear shift indicator on the speedo console that tells you when to up shift or down shift if you are driving in the wrong gear at a certain speed. Shift to the EON to 2nd and the power generates at an even pace. We touched speeds of 140KMPH on our Udaipur highway run which is a lot for a car in this segment. The EON has a nice city driving character to it. The steering feels light and this should help maneuvering the car on busy roads. The EON feels much planted at high speeds which are unheard of in cars in this price segment. The drive feel is reassuring and not a single time did the EON feel nervous or out of composure. You need to meticulously shift between the gears to stay in the power-band of this 3 pot engine car, never the less you soon get used to this and then you can really enjoy the EONs drive character. The ride and handling of the EON is steady partly due to the superb suspension setup on the car. The EON has a nice city driving character to it. The steering feels light and this should help maneuvering the car on busy roads. The EON feels much planted at high speeds which are unheard of in cars in this price segment. The drive feel is reassuring and not a single time did the EON feel nervous or out of composure. You need to meticulously shift between the gears to stay in the power-band of this 3 pot engine car, never the less you soon get used to this and then you can really enjoy the EONs drive character. The ride and handling of the EON is steady partly due to the superb suspension setup on the car. With Mc person sturt in the front and Gas filled shoxs in the rear the ride quality is surprisingly far advanced for this segment. The EON not only drives well but also is calm when thrown in corners and sharp bends. The EON has front discs and rear drum that again are best in class and have a nice sting on them. The Electric power steering on the EON is a big boon as we mentioned earlier in busy traffic conditions. We found accurate gear shifts on the EON with gear ratios tuned majorly for fuel efficiency and in-city drives. 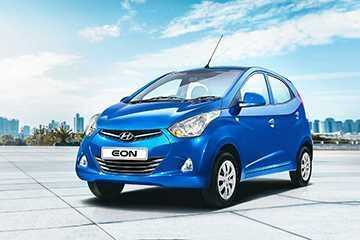 Hyundai has been a master at manufacturing small cars in India and with the EON now Hyundai betters its standing. The EON is a complete overall package, just perfect for someone who wants his first car, it has class leading dimensions and equipment level. The drive is very comfortable and something unseen in this segment. Hyundai has done a very fine job in making the EON as a class leading product with many features offered for the first time in the segment. Hyundai claims a fuel efficiency of 21.1kmpl which again makes it the segment leader. The EON is easily the best car now in the segment with prices starting at Rs. 2.69lakhs Ex Showroom Delhi. There is nothing much that Hyundai can go wrong with the EON, everything is just perfect. Superb quality exteriors and interiors, a very catchy design element and a potent and efficient 815cc engine making the EON the best buy in the Rs 2.5 lakh to Rs 3.5 lakh segment currently. A true winner and a sure game changer, the Hyundai EON is here.